Ma Mon Luk : still and all, one of the best noodle meals one can have in the city for less than a hundred bucks! From Lung Center, I found myself in the auto spare parts haven that is Banawe, Quezon City to have my buggy repainted and fixed. Guess what was waiting for me across the street: the ageless Ma Mon Luk restaurant, still looking like it hasn’t shed its hangover from the 1940s! You know if a resto is still at it by the number of cars parked outside its doors. It was a usual busy Sunday at the last surviving branch of Ma Mon Luk, the best place in (or near) Manila to savor a hot bowl of Chinese noodles. Okay, don’t forget the siopao. See this related post. 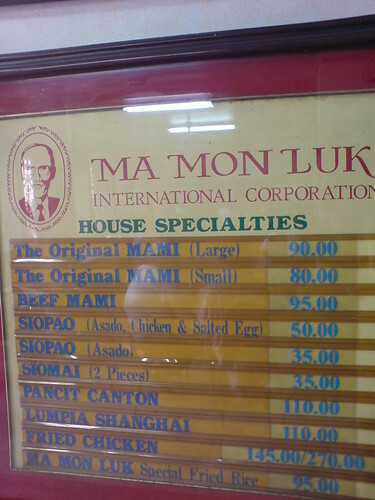 The Ma Mon Luk menu. Some of the best things in life…. cost less than a hundred bucks! Count in their rice toppings (P85), as well as a slew of Chinese dishes (e.g. chopsuey, camaron rebosado, fried chicken, beef steak and others – from P95 to P245). I don’t know if the Quiapo branch is still open. 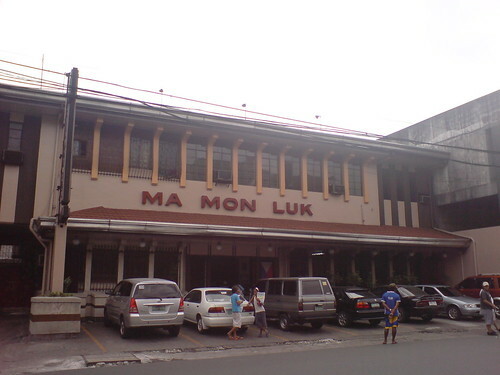 Ma Mon Luk Restaurant is at 408 Quezon Avenue, Quezon City. Telephone Number 712-35-60. The best ka talaga Ajay…you’ve motivated me to finally go and try Ma Mon Luk. Alin ang recommeded items mo from their menu? the noodles, the soup, the sauce has been the same since the first time i ate here.. In L.A., you can get the Ma Mon Luk taste at Asian Noodles (branches at Chinatown and Glendale). The menu’s the same, but they changed the name. Maybe it has something to do with corporate ownership. The mami and siopao never fail to bring back a flood of memories. i miss their siopao! when i was a kid, my parents would bring us siopao as pasalubong. Eric, heard about the branches in CA… that’s why the menu says Ma Mon Luk International Corp?? 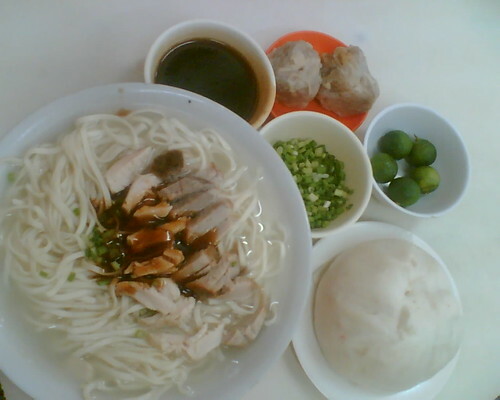 Was in Ma Mon Luk also last Sunday, Feb. 10 and bought take out mami and siopao for my Mom. She was craving for the Ma Mon Luk specialties since December and it was only last Sunday that I was able to go. It was still the same taste according to my Mom. She was so happy with the treat and for us (me and my siblings) we are happy as well since we made Mom happy. I got her 4 orders of the Bola-Bola and 2 orders of the Large Special Mami. She eats the siopao one at a time. Mom mentioned that it was like travelling to memory lane when she’s a kid with every bite. BTW, Quiapo branch is still open. It was the the Quiapo number that I got from PLDT. You just made me miss eating at ma mon luk. I have to drop by there next week. See what you did there? Egad Ade, didn’t know Ma Mon Luk had this PROFOUND effect on pipol??!! Sorry to get you salivating. for me, Lagi pag mamonluk.. it’s all about family. It has made a mark in our hearts since we were kids. reminds me of how much our dad loves us (pati na rin si mom).. now that I’m all grown up, baligtad naman ako naman ang nagpasalubong sa knya. Ang sarap tingnan how he still enjoys the siopao (peeling off first the outer layer, that’s how we do it in the olden days and still) then putting sauce in his special mami. how I miss the days nung bata pa siya at malakas. sarap balik balikan. okay i just convinced my hubby to have our merienda there just about now, hehe. any info on how ma mon luk had survived after three decades? what is the secret of ma mon luk’s stability? more power to you, ajay! I passed by Ma Mon Luk Quiapo and it’s still open. Bad thing is that they ran out of siopao and have to drive to Ma Mon Luk Quezon Ave.